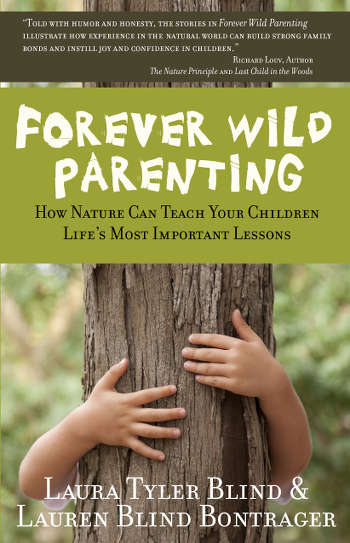 With humorous anecdotes and compelling insight, Forever Wild Parenting brings nature and adventure back into the art of parenting. Authors Laura Tyler Blind and Lauren Blind Bontrager demonstrate the importance of connecting children to the natural world at a crucial time when video games and cell phones have top priority. This much-needed book cuts right to the heart of the modern day conundrum - the overfilled calendars of today’s families. Through their own fond memories and experiences, Blind and Bontrager present a powerful case of the value in allowing kids to be kids. With longer school days, an abundance of organized, after-school activities, and electronic gadgetry abound, are our children given the opportunity to explore, to make mistakes, to learn real life lessons on their own, to be free, to roam wild? To us, as parents, this almost sounds a little scary. Yet, think about your own childhood and all you learned from those independent opportunities. Being outdoors, getting dirty, working conflict out with the neighbor kids and your siblings on your own. The world is out there, just waiting to be explored and absorbed. Send your kids outside and go out with them, occasionally, too! Forever Wild Parenting offers a bundle of activities you and your children can partake in together, swallowing up your surroundings and getting back to the basics, connecting with what makes the world turn.